IT outsourcing has been a subject of heated discussion for almost a decade. Some people worry that the quality of the final product will be poor; some blame freelancers for IP rights violations, while others praise the cost-efficiency of their multinational teams. However, one thing remains true: Outsourcing is a great way to get the job done at a reasonable cost. If you are a startup – this may be especially true. Offshore development might be a real life-saver, as it may help you reduce your burn rate considerably. Yet, not all outsourcing destinations are equally cost-efficient in terms of development quality. That is why we have prepared a comparative overview of the software development prices across some of the most popular outsourcing destinations. Level of seniority. This one is pretty obvious. More experienced developers have higher rates than newbies, and there is a good reason for that. Tech stack. The programming languages or specific tech solutions used by a software developer might also have an impact on the rate. For example, iOS developers often charge slightly more than Android developers. In addition, less mainstream technologies including Clojure, Rust, Elixir, or, vice versa, tech stacks that are currently in-demand such as Go or Swift, are typically priced higher. Freelancer vs. a company. 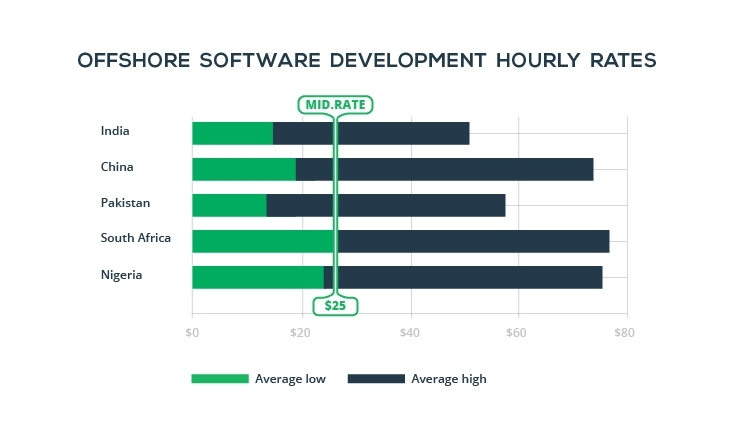 Freelance software development rates are lower than the ones a company can offer. However, with a slightly higher cost you get the guarantees and safety which freelancers simply cannot provide. Long-term vs. short-term. Long-term commitment can be priced lower than a one-time project. Some developers (and most companies) prefer an inflow of steady tasks instead of short-term projects. Thus, a long-term cooperation plan can help you secure a lower hourly rate. That is why we will talk about the average low and the average high values instead of trying to put a single price tag on every developer in the country. While the gap between these two values might be insignificant, the difference is often distinct, especially in terms of software quality. 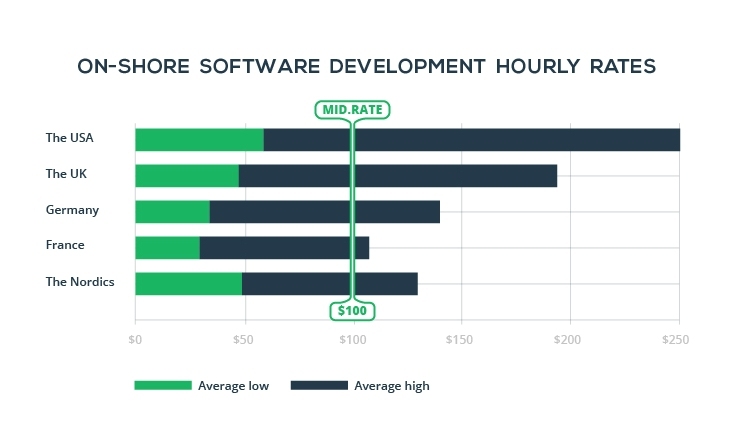 Therefore, in order to make the right investment decision when hiring a software developer or an outsourcing company, it is important to understand the spectrum of hourly rates that you may come across. The provided research aims at one of the most burning issues of our rapidly digitizing world, namely the prices of IT services. To provide reliable data on the topic, we have gathered all the available information and combined it with our own knowledge of the IT outsourcing industry. For your convenience, the comparative analysis focuses on the major IT outsourcing options, such as hiring locally, nearshoring, and offshoring development. Thus, our research covers the most popular outsourcing destinations, as well as the less known locations. This type of outsourcing typically implies that a company will hire developers within the country it is based in. Thus, when saying on-shore, we usually mean the USA and Western European countries, including the UK, Germany, France, and the Nordics. 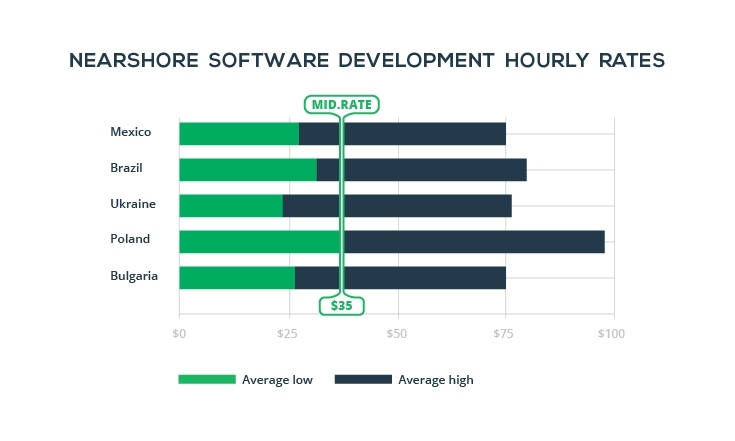 The average hourly rate for a software developer here is rather high, due to the overall higher standard of living and average wages in the country. Thus, the cost can vary from $50 to $200 per hour (some companies might charge even more, depending on a number of aspects). If you are looking for good quality service, a reasonable price for IT services here would be closer to $100 per hour. This is one of the most significant drawbacks of on-shore outsourcing. Among the other pitfalls worth mentioning is the limited talent pool resulting from growing the talent shortage in some developed countries (take for example Israel or UK). However, the benefits of such an option is indisputable: the absence of language and cultural barriers, the same (or close) time zones, convenience of travel, and thus efficient communication and better reliability. Please note: If you decide to look for a software development team locally, you still need to take the location into account. The rates might vary greatly from state to state or from city to city. For example, the average wages in California and Nebraska might differ drastically. Asian countries, namely India, China, Pakistan, and the Philippines, represent another popular outsourcing destination. India is often considered to be the most popular outsourcing destination. At the same time, within the IT services sector, the country is often criticized not only for producing extremely poor quality software (more on that later), but for communication issues. One more, less known, outsourcing destination is Africa: South Africa, Nigeria, and Kenya have just joined the list of IT service providers, and represent a less competitive, emerging market. However, there is still not enough evidence to consider this market as a promising outsourcing location. 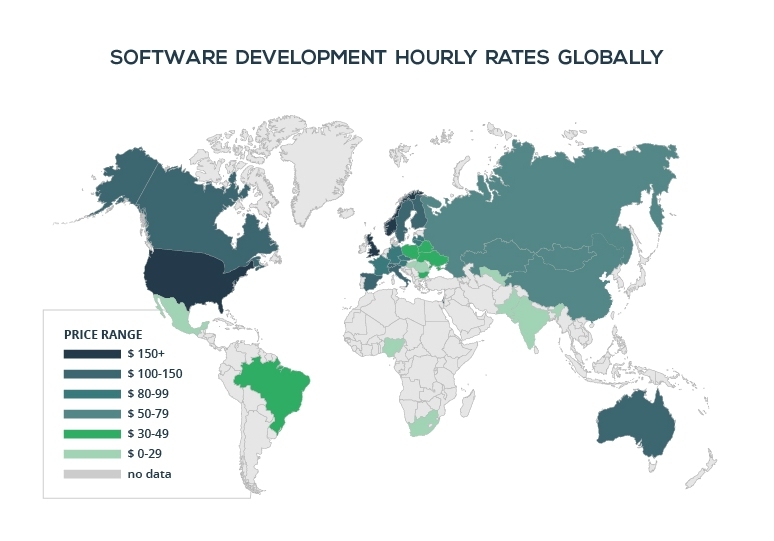 Unlike local US and European rates, offshore rates for software development might be rather low. The price usually varies from $15 to $30, with the average rate of $25 per hour. Please note: While you can certainly find cheaper offerings (starting as low as $5 per hour), at such a cost, you shouldn’t expect to receive services which can be even considered as average quality. However, even a rate of more than $30/hour doesn’t necessarily guarantee 100% quality. Poor quality is probably the main drawback of cheaper offshore development. Combined with the lack of understanding and communication, cultural barriers and distance; serious damage can be inflicted on your business. On the other hand, many large companies hire offshore developers and set up dedicated development centers to outsource minor software tasks. With special training and strong business processes in place, it is possible to nurture the right talent for your company. However, this approach is not suitable for growing businesses and startups. The concept of nearshore outsourcing might have a different meaning depending on the country your business is located in. For companies in the US, the nearest possible IT service markets are South America, Mexico, and Canada. For Western European clients, there is a more convenient option, Eastern European and Post-Soviet countries. Please note: Despite the significant distance, there are hundreds of US startups and companies choosing to hire dedicated development teams and set up R&D centers in Eastern European countries including Ukraine, Belarus, and Poland. The reason for that is pretty straightforward: unparalleled quality of service at a reasonable cost. A software engineer’s hourly rate in this region usually ranges from $20 to $50/hour with the average rate being close to $35/hour. However, the rates can vary greatly depending on the country. For example, Poland is a more expensive location for offshoring development than any of the other Post-Soviet countries. A country that is particularly worth mentioning is Ukraine. Being a relatively young tech nation, the country boasts one of the largest tech talent pools in Europe (and globally). At the same time, the IT service prices in Ukraine are still comparatively low due to the overall cheap labor cost and the growing competition in the IT sphere. Yet, unlike offshore destinations with relatively cheap software developer services, Ukraine’s main benefit is not the cost of outsourcing. Ukraine is considered to be a very attractive outsourcing destination because of the optimal price/quality ratio. Thanks to a solid technical education and a strong scientific background, Ukrainian developers are ranked high among the best IT specialists. The fact that a number of leading tech companies such as Samsung Electronics, Huawei, Siemens, Boeing, and Oracle, located their R&D centers in Ukraine speaks for itself. Moreover, some of the most innovative startups, including PetCube, Looksery (acquired by Snap), Mobalytics (Techcrunch Disrupt 2016 winner), Readdle, and Grammarly, have originated in Ukraine. Despite the reasonable costs and high quality of services, nearshore outsourcing still has some pitfalls that a business owner should take into consideration. However, the listed challenges can be easily solved with the help of professional management and streamlined business processes. While cost reduction remains the leading driving force of outsourcing, such aspects as increasing business core focus and solving capability issues are catching up, according to the research by Deloitte. Thus, more businesses would rather choose good quality and efficient communication over cheap software developer rates. After all, it’s conventional wisdom: Buy cheaply and you will pay dearly. To find the best outsourcing partner, consider the benefits and the real business value a company can offer. This can translate into innovative solutions, specific technology or domain experience, efficient business processes and streamlined communication, as well as rare expertise and deep business understanding. If the price is the only selling point in the offering, better keep looking. We at Eastern Peak combine solid business expertise, professional project management, efficient communication and collaboration practices, and cutting-edge tech skills to help our clients build world-class software solutions. Contact us now to schedule a 15-minute call with one of our project managers and find out how we can help your business grow.